An older gentleman wiped a thick bead of sweat off his brow. He perched on a wooden platform high in the treetops, gazing at his wife. He moved carefully across the widely spaced rungs of the horizontal ladder, call the rail track, where one misstep would leave him hanging in midair. What’s more amazing, is that his kids put him up to this. 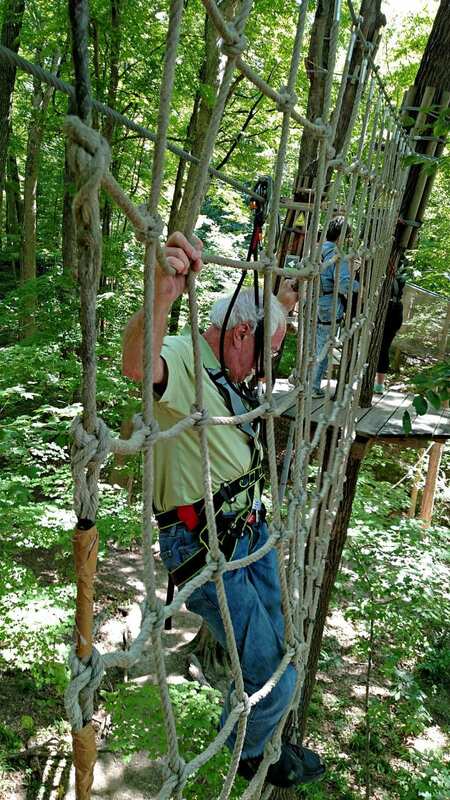 “A few years back, we went on a trip and did our first zip line. We so enjoyed soaring over the treetops, that we couldn’t wait to tell our kids about it when we got home. I think that’s why they thought this would make a great 30th-anniversary gift for us. I don’t think they realized what they were getting us into…. Or maybe they did.” He said chuckling as he continued to wipe his brow and muster the confidence to head across the element towards his beloved wife. Being a seasoned ropes course aficionado, I have seen all types and ages of people attempting the high ropes, but I have to say, this cute anniversary couple was the oldest I have ever seen attached to rope in the trees. 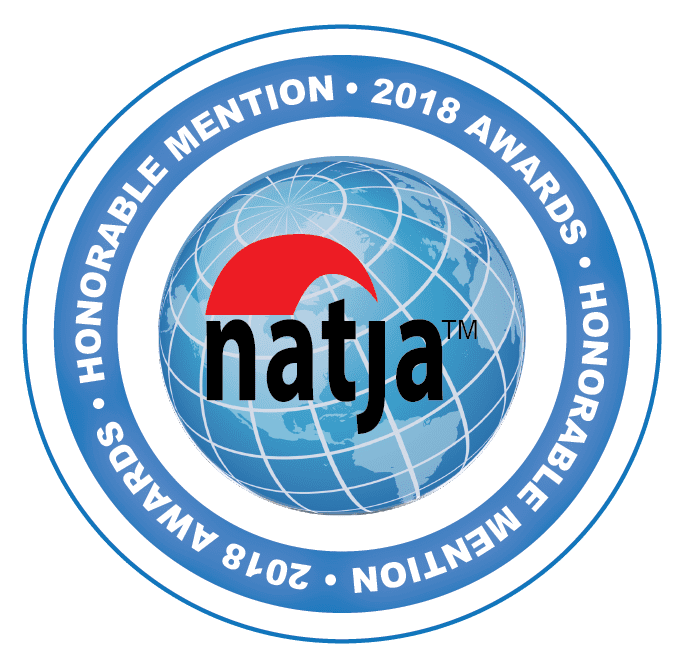 I had the privilege of following them all the way through the Go Ape Zipline and Treetop Adventure located at Eagle Creek Reservoir just outside of Indianapolis. I watched in quiet and, sometimes, not so quiet appreciation and amusement as the 30th wedding anniversary couple took to the trees to conquer the course. Behind us were a gregarious three-some of 30 something friends who were, as they would say ‘city folk’. They were here to conquer their fears as well. They had millennial sensibilities and the latest in name brand athletic apparel, but it was obvious that this was the height of their outdoor adventures. How did I find myself in this most unlikely cast of intrepid explorers? It all became begun on a beautiful and unseasonably temperate Tuesday morning in downtown Indianapolis. 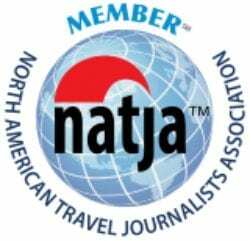 Having never been to the Midwest, let alone Indianapolis, I decided to take a little time after my convention to find out what kind of outdoor adventures could be had here. My day didn’t start with a bang, but rather a much-needed sleep in. I was still a bit sore from all of the fun I had just up the road in Hamilton County. By the time I finally rolled out of bed, I was ready to sally forth and enjoy the day. My new partner for adventure Nate, from Visit Indy, came to pick me up for a delicious lunch to fuel up for our adventures. 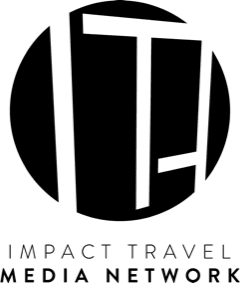 I have been hearing about Bluebeard, a restaurant and bar located in the historic Holy Rosary Neighborhood on the southeast edge of downtown, for the entire trip to Indianapolis. 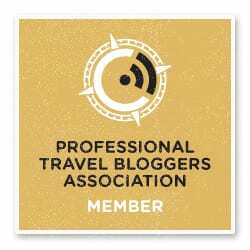 The other bloggers at the Bloghouse convention said eating at Bluebeard was at the top of their must do list. Needless to say, I was super excited to head there for lunch and try it myself. The restaurant space is a renovated 1924 warehouse, complete with a family dining room, a bar room, and a courtyard. The beautiful day implored us to sit in the courtyard. Nate explained to me that it isn’t just the locally sourced meat and produce that sets Bluebeard apart, but also the amazing bread. It came from next door at Amelia’s, a bakery that supplies hearth-baked bread in the Italian tradition for many of the high-end restaurants around town. That information alone led to the quick decision of getting a bread plate with peach butter, anchovy butter, roasted garlic & oil as a starter. It was every bit as delicious as it sounded but dangerously tempting to keep tasting. Luckily our entrées came out quickly. Nate tried the Formaggio Sandwich, which consisted of cheddar, boursin, capicola, provolone, pickled red onion, city loaf. 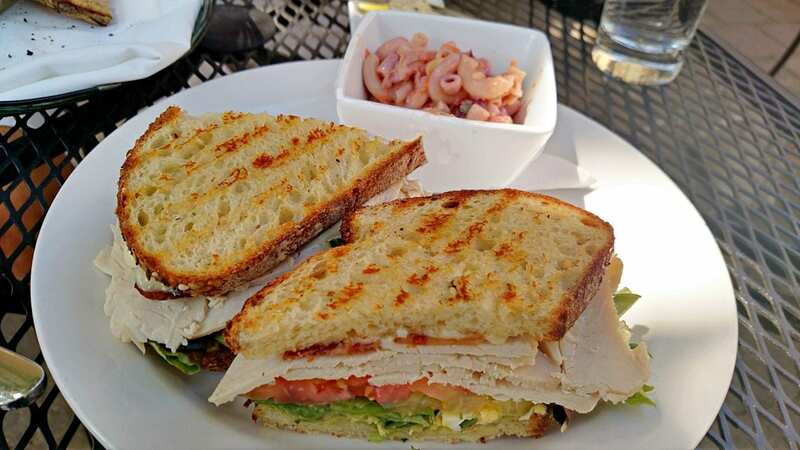 I had the Turkey Sandwich, with smoked turkey breast, guacamole, hard boiled egg, bleu cheese aioli, bacon, greens, tomato, and pullman bun. I now knew what all the commotion was about. Not only was the food quality of self-evident, it was truly delicious. Feeling fat and happy we headed out to the car to go to Eagle Creek reservoir to burn off some of that lunch climbing around amongst the trees. 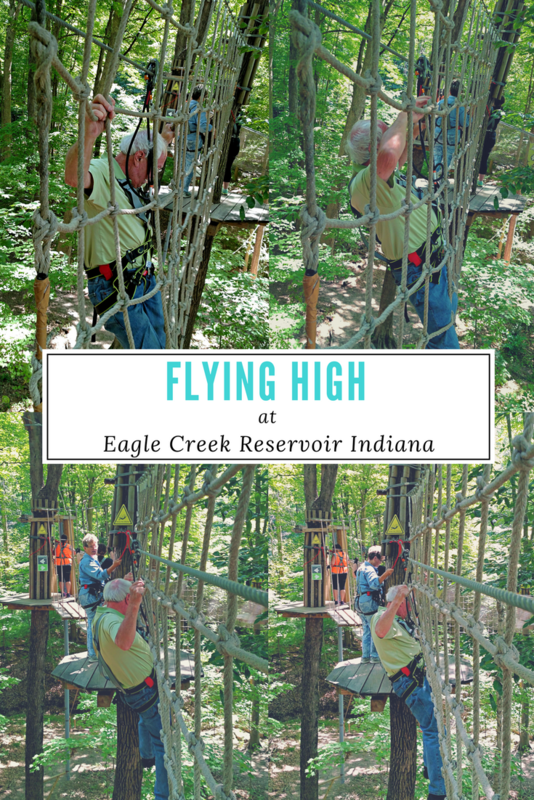 It was hard to believe that, just a short distance from the thriving metropolis of downtown Indy, lies the serene nature of Eagle Creek Reservoir. This urban oasis sits nestled among the trees in an upscale suburban neighborhood. 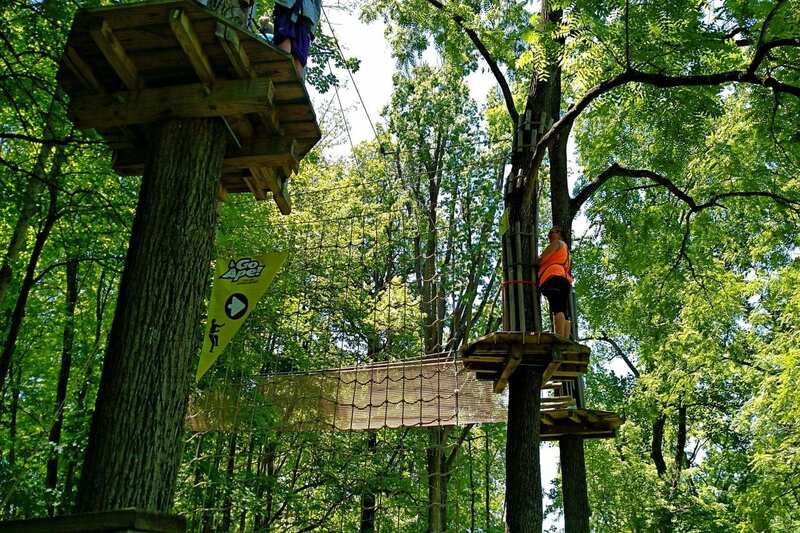 It’s a gigantic metropolitan park that offers 1,400 acres of water, 3900 acres of land, and one rocking ropes course – Go Ape Indy. As we checked in and waited for our tour, I started to observe the tour ahead of us that was just setting out. 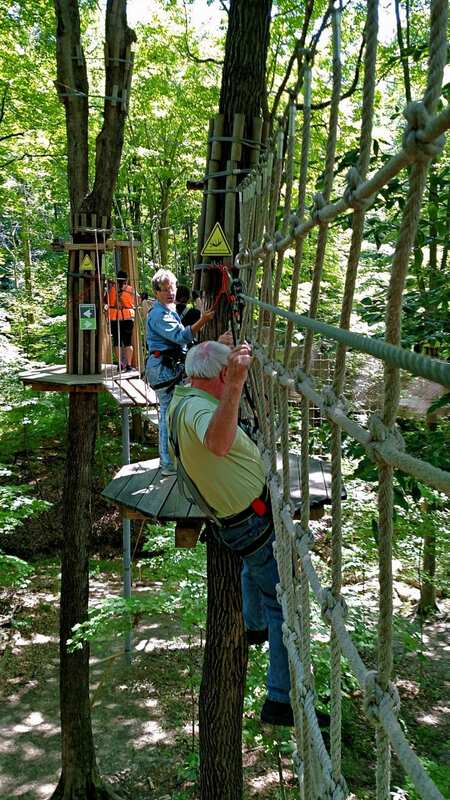 I noticed that they neither had helmets or gloves, which indicated to me that this was a much lower intensity course then the Aerial Adventures Course in Hamilton County I had just finished the day before. I was slightly disappointed, fearing that Nate and I would miss out on an extreme adventure. Perhaps my advice to Nate that he could skip his post adventure workout may have been a bit misguided, but truth be told, any day that can be spent on rope climbing around in the trees is it one heck of a great day! 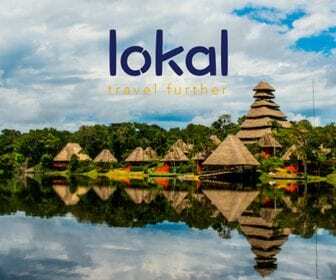 Not only that, but this course was extremely user-friendly, and also family-friendly. There were participants of all shapes and sizes as well as age demographics (10 years old and up) out there literally swinging from treetops going ape. After the typical briefing and intro teaching us how to use our safety line and trolley for the zip lines, we were ready to begin. Maybe it is the ropes course facilitator in me, but I fully enjoyed watching Nate, the older couple in front of us, and the three millennial city slickers behind us experiencing the course for the first time. I have come to love seeing the fear and nervousness of people who start out unsure of their abilities build into their excitement after conquering each element. This is a great course to learn the ropes on. Go Ape was not without challenges. By far the most fun and fear inducing element was the Tarzan Swing. 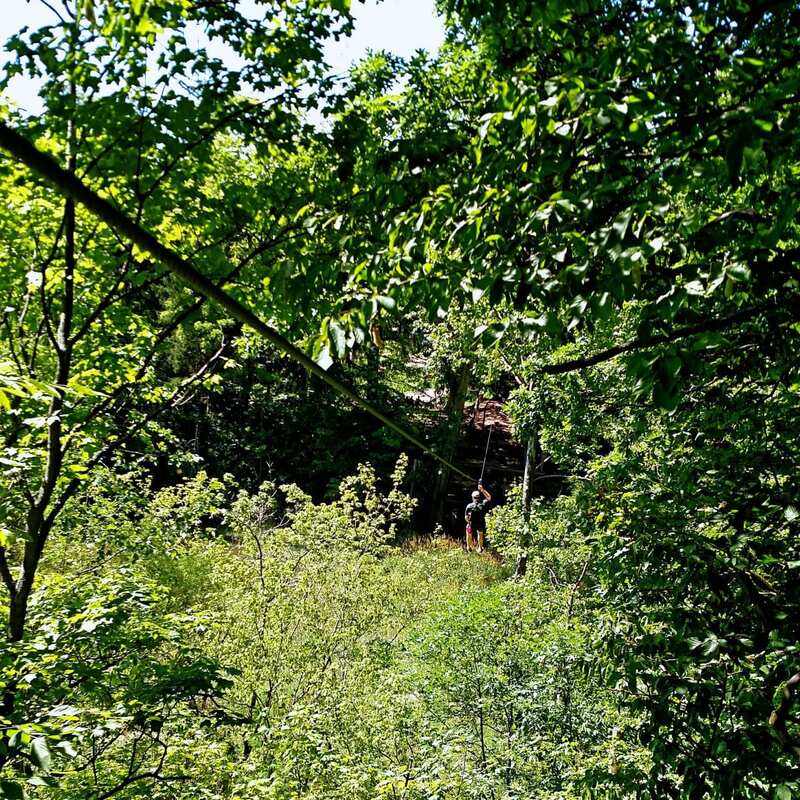 The Tarzan Swing consisted of standing on a platform, approximately 40 feet up, attached to a rope from above. You then jump out into mid-air and the rope catches you and swings you into a giant net. You bounce off a few times, and then proceed to climb the net up to the next platform. There wasn’t a lot of skill involved, but it took a lot of nerve to jump and trust the rope. As with most of this course, there is an easier option, and the more extreme option. Nate and I opted for the extreme option every time on the course. The older couple opted for the easier route around this element. 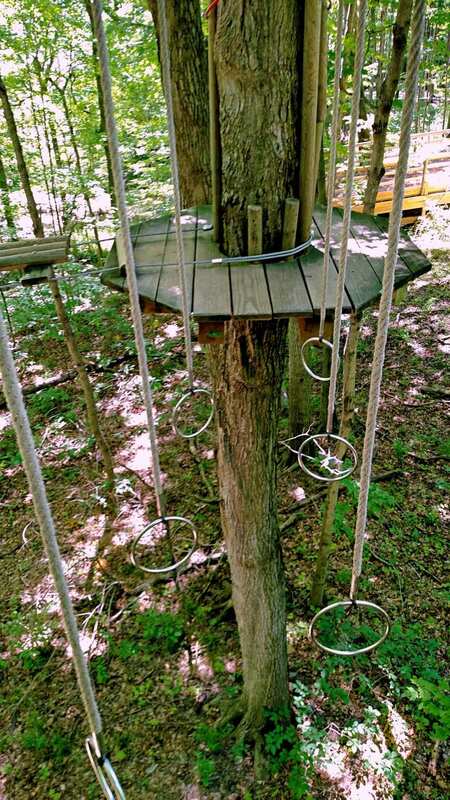 We strongly encouraged the city slickers to take the Tarzan Swing. After much encouragement, possibly bordering on harassment, they took the jump one by one streaking with laughter or the whole way. After they finished the swing, every one of them was so psyched they had actually gone for it that they were high fiving each other and grinning from ear to ear! That is the experience that I love most about ropes courses, the personal empowerment that comes from conquering one’s fears and doing something outside of one’s personal comfort zone. It took us a few hours to complete the course. My biggest tip for you is to ensure that you allow for plenty of time to go through the course. With such a range of participants, there will be some elements that people will struggle with. You are following others the whole way through, so moments of fear and exhaustion from other groups (or maybe your own) can definitely setback the time table. We were a bit behind in our perceived timetable so we had to hurry off the course. We said bye to our new friends on the way out. The city folk were still smiling from the Tarzan Swing. The anniversary couple were holding hands and sneaking kisses. It turns out their kids bought them a decent gift after all. We got into our car and headed out to Eagle Creek Outfitters. 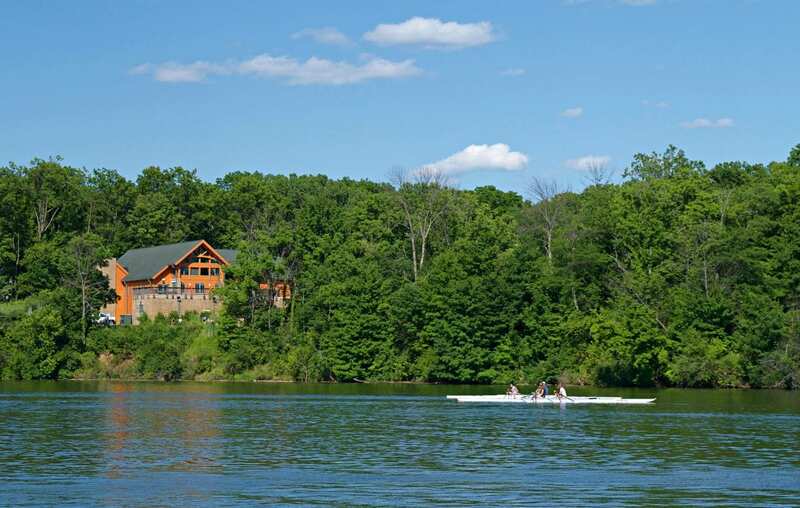 Eagle Creek Outfitters rents most forms of aquatic transportation including kayaks, canoes, paddle boats, row boats, stand up paddle boards, small-scale sailboats, and pontoon boats. You can even rent a bike to cruise around the lake on. When we arrived, we were given our choice of watercraft. My first thought was to take out a kayak or paddleboard. 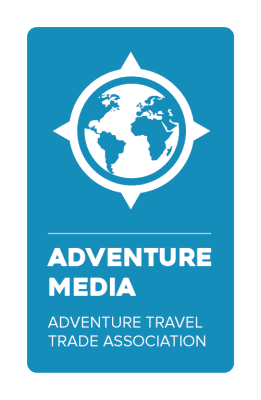 They even offer stand up paddle board yoga classes on the weekends, and a full moon guided kayaking trips (I’m saving that one for my return trip with Ed)! In the end, I decided to do my journalistic due diligence and opt for a pontoon tour so I could learn a bit about the area and take photos. Our guide was kind enough to provide us both a cold much-needed bottle of water and then we headed out onto the water. Eagle Creek Park is one of the largest city parks in the country, located 6 miles northwest of downtown Indy. It encompasses 1,400 acres of water & 3,900 acres of land. The northern section of Eagle Creek Reservoir has limited boat traffic & plenty of good bird watching. The southern section of Eagle Creek Reservoir is where you will find the majority of motorboat traffic & residential land. 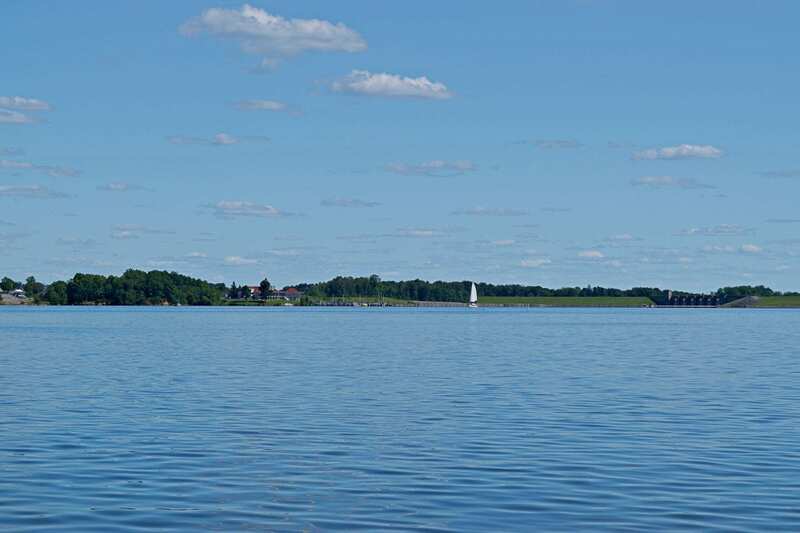 There is not too much motor boat traffic in Eagle Creek Reservoir as it not only has a 10 hp limit, but alcohol is prohibited as well. On the south end you will also find Rick’s Cafe Boatyard, 42nd Street Boat Ramp, Hobie Beach (the one designated swimming beach with lots of bouncy water toys including a trampoline in the designated swim area), Eagle Creek Sailing Club, and the dam. As we headed out from the dock, the first thing I noticed was tons of buoys in the water arranged in a linear fashion. Our driver explained to us how much rowing takes place in Eagle Creek Reservoir. 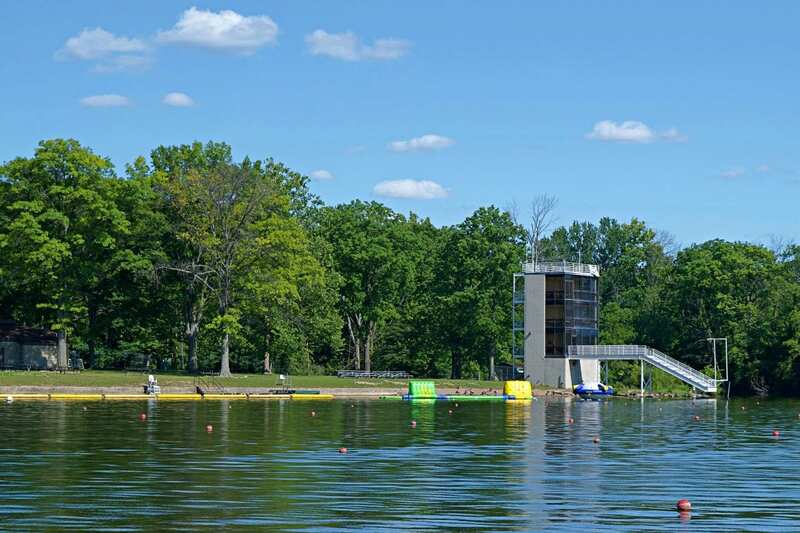 There is the Indianapolis Rowing Center, which offers classes and programs for new and experienced rowers from ages 13-18, adult and collegiate rowers, and even programming for underprivileged youth and the physically disabled. 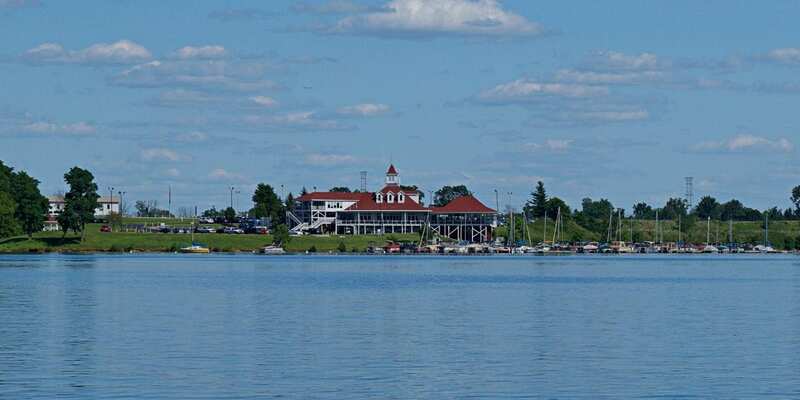 It is also a main hub for collegiate rowing. 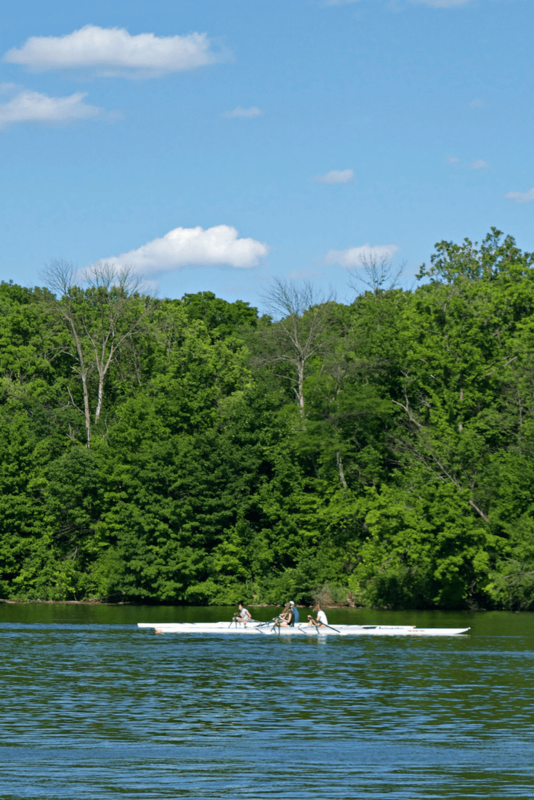 Since 2011, the Big Ten Conference has held their Big Ten Rowing Championships in Eagle Creek Park every year, and the NCAA Rowing Championships have been held in Eagle Creek Park quite often. The Pan AM Games have even been rowed here. This was yet another thing I would be putting on my to do list for my return trip to Indy. I have always wanted to learn to row crew. When we moved to San Diego, I was sure that we would be picking it up, but instead, we found ourselves racing traditional Hawaiian Outrigger Canoes. Once we began to adventure writing, our paddling seemed to fall by the wayside. It’s tough to be consistent making practices when traveling often. A writer’s work is never done. As we tooled around the reservoir, our boat captain/guide shared with us some of the more interesting fish stories, so to speak. Part of the reason Ed couldn’t make this trip was that he was working on his scuba Dive Master courses, so I asked about dive sites. Scuba diving for the public is, in fact, prohibited, but many of the local fire departments and search and rescue teams do dive it for training purposes. It was on one of these dives, that the monster fish was spotted. Eagle Creek Park started as an eleven-acre plot of land outside of a town called Trader’s Point. 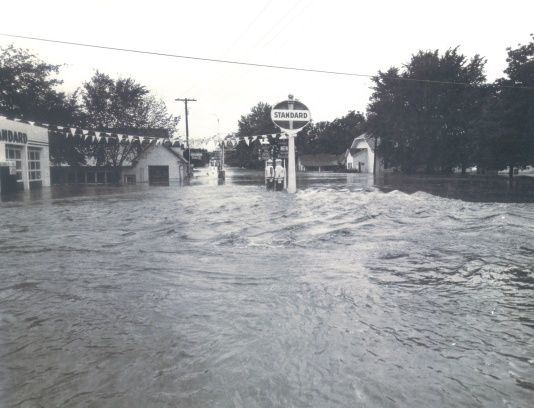 In the late 50’s Trader’s Point was flooded, which prompted the construction of Eagle Creek Reservoir and the formation of Eagle Creek Park. Through negotiation and eminent domain, the state acquired the parkland and razed the town of Trader’s Point. Some people claim that the reservoir waters never reached the town. This historic map page and tells a murky and somewhat inconclusive story. The divers, swear the truth lies under the water. They say there is an old gas station covered by the lake. Perhaps the one from Trader’s Point. The group decided to check it out on a training dive. Just as they were swimming through one of the rooms towards a large doorway, they gazed in and spied two very large eyes, some very long whiskers, and a giant mouth. A mouth so large it took up the majority of the doorway. The lead diver and the rest of the team hightailed it out of there! One wonders if the gargantuan catfish had grown too large to escape the underwater gas station, or just lurked in there to protect its territory. I was given and no further reports of other teams visiting to know for sure. We discovered another dam mystery. 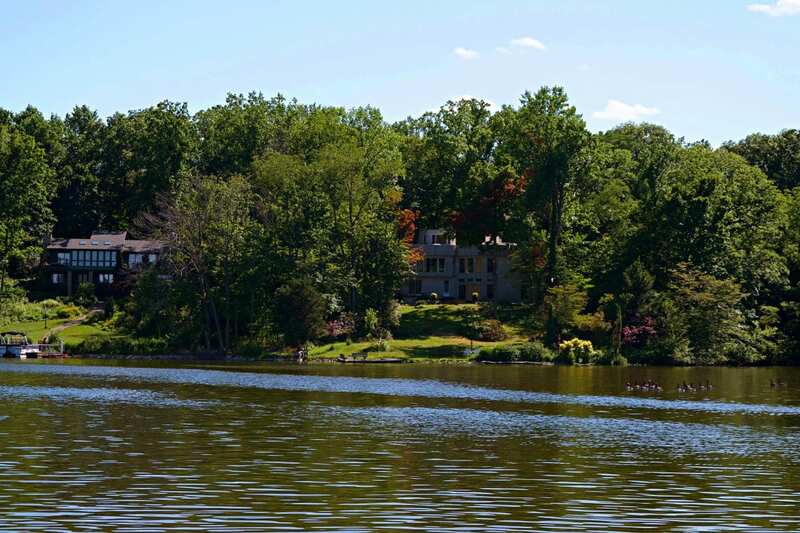 As we continued on past large upscale homes and estates that dotted the shores, we sighted Eagle Creek Dam. It’s one of the largest dams in Indiana and supplies a significant portion of Indianapolis’s drinking water. Next to the dam there is a large, steep grassy hill. We noticed that the grass had been mowed in perfectly symmetrical horizontal lines across its entirety. Our pontoon captain told us that the dam lawnmowers where an enigma onto themselves. He had not heard of anyone that has ever seen that lawn get mowed, yet it is always precisely and expertly manicured. I imagined setting up a week long stake out by the reservoir to catch these expert purveyors of power tools in action. To me, it seems near impossible to mow in such straight lines on such a steep hill. On our way back to the dock, we passed by the swim beach filled with fun looking water toys and a few boats out practicing rowing crew. By the time we rounded the corner and headed back to the boat dock, I realize what an appetite I had worked up. Luckily for me, we were heading to the south shore to Rick’s Cafe Boatyard. 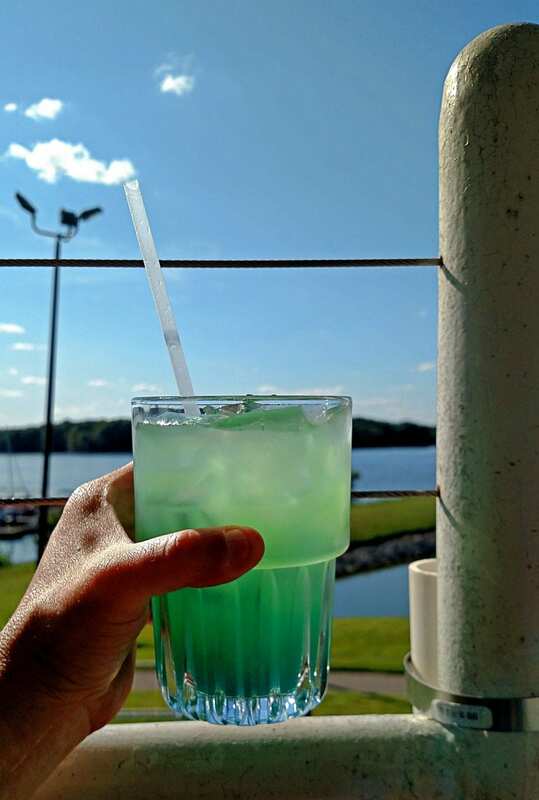 Rick’s Café Boatyard is a large restaurant that sits on the shore of the reservoir with an amazing view off the back patio. (The view of Rick’s from the water is so good it’s the title image for the article.) Being that everything is better outdoors, we opted for a patio seat to enjoy the view. 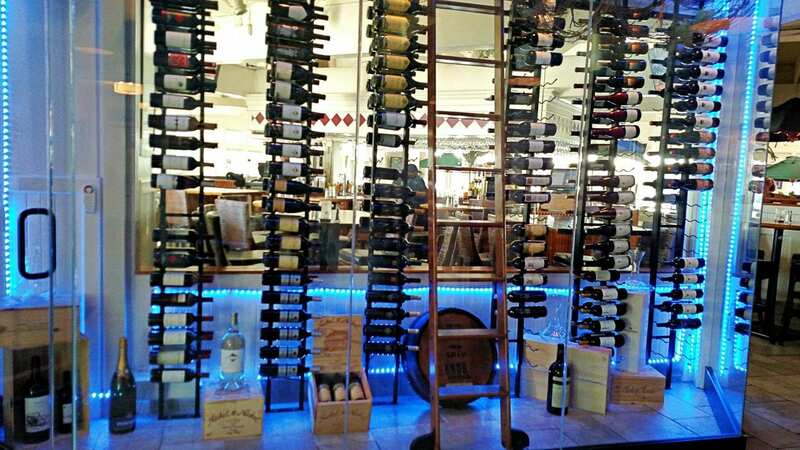 The menu is large and extensive with a wide variety of seafood that I’m sure would suit the taste of any seafood lover. 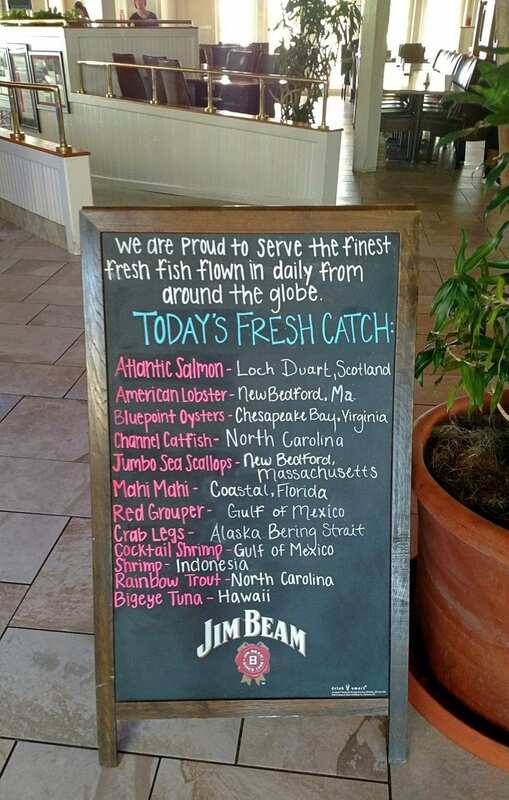 Unfortunately, I am actually not a seafood fan so you’ll have to discover that on your own. Nate and I decided to share a couple of appetizers before getting our main dishes. We also opted for a celebratory adult beverage to cheers the day. Nate had a local craft beer, while I had a delicious Banana Boat, a cocktail of tropical fruitiness. I tend to be one of those kind of drinkers, if it would appeal to a 16-year-old girl, you can bet I’m all about it. Once our appetizers arrived, we knew that we would not be ordering main courses. They were huge! 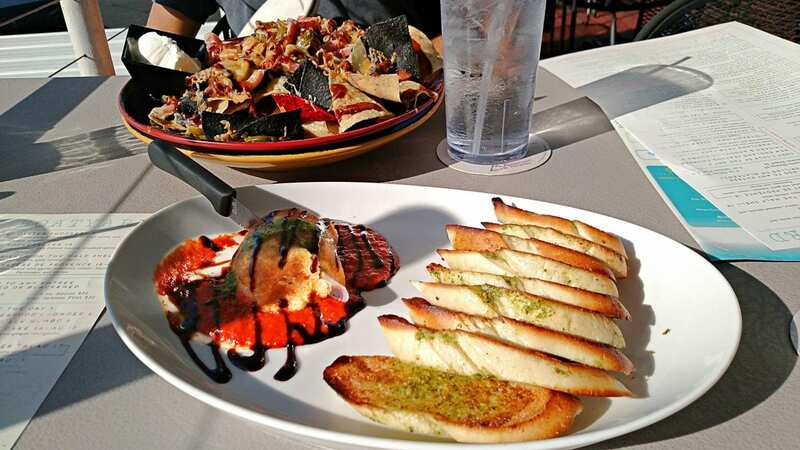 We opted for the baked goat cheese which consisted of fresh goat cheese rolled in crouton crumbs over marinara sauce with pistachio pesto french bread, and the barbecue pork nachos. 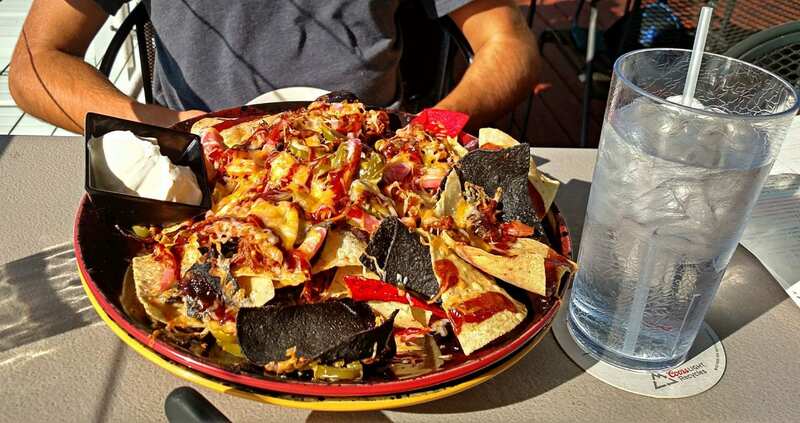 Who knew bbq pork would be so amazing in nachos! We did our best to conquer both appetizers, but alas, though we made a valiant effort, there were a few chips left uneaten. We headed back into Indy full and happy from a fun filled day of outdoor activity. The only thing I could think of that would make Eagle Creek Reservoir better would be a campground or overnight cabins. Gazing out the car window at all of the road cyclists whizzing by, I realized we barely scratched the surface of the outdoor adventure fun that can be had. 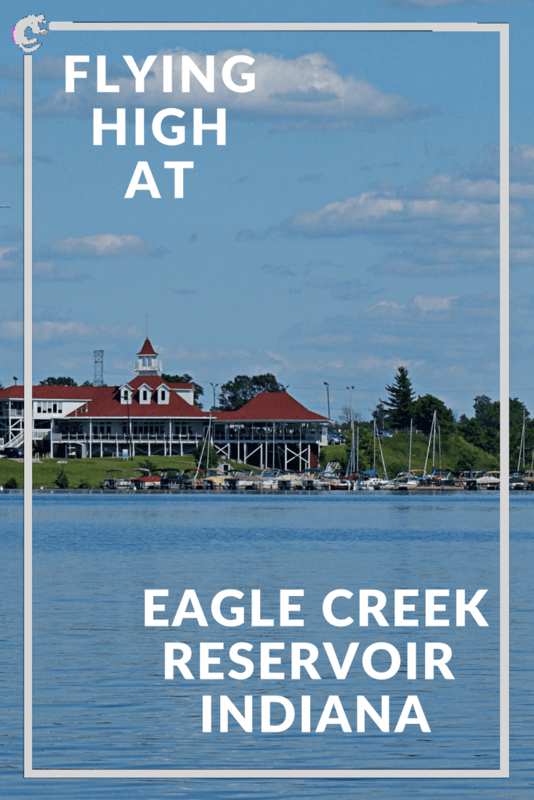 Eagle Creek has summer outdoor concerts, a dog park, the swim beach, fishing, picnicking, bird watching, cross-country skiing and fall hay rides. The park boasts over 16 miles of trails with six major trails ranging from easy to moderate difficulty. There is even a fitness trail consisting of 20 stations with a total of over 32 exercises. The fitness stations remind me a lot of the fitness parks that we saw all over Thailand. No wonder Eagle Creek Park is loved by the outdoorsy folks in Indianapolis. It also shouldn’t be overlooked by outdoor loving visitors. Perhaps the most amazing thing is that such a place exists so close to city center. 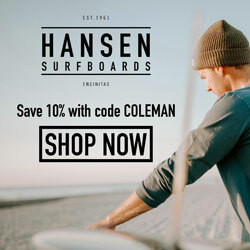 One can imagine combining within one day outdoor adventure and city culture. Just one more thing you can’t miss when visiting Indianapolis.